The “Deflategate” story involving the New England Patriots first broke all the way back in January following the American League Championship Game against the Indianapolis Colts. A little over six months later – six! – it is still dominating headlines, and unfortunately does not appear to be going away any time soon. As everyone almost certainly knows by now, thanks in large part to ESPN and Twitter, Patriots quarterback Tom Brady lost his appeal to the National Football League of his four game suspension. The best part of this story is that the appeal was heard by the same people who handed down the punishment – the NFL. I can’t believe the arbitrator gave a favorable ruling on the Commissioner’s original decision – it’s like those 2 people were in cahoots. As poor of a system as this is, Brady and his agent and attorney, Don Yee, simply cannot complain about it. This is the protocol the NFL Players Association agreed to in the most recent Collective Bargaining Agreement, so everyone complaining about the system only has the players like Brady to blame. The Head Coach of the Patriots, Bill Belichick, also took and avoided questions about the recent Deflategate developments. 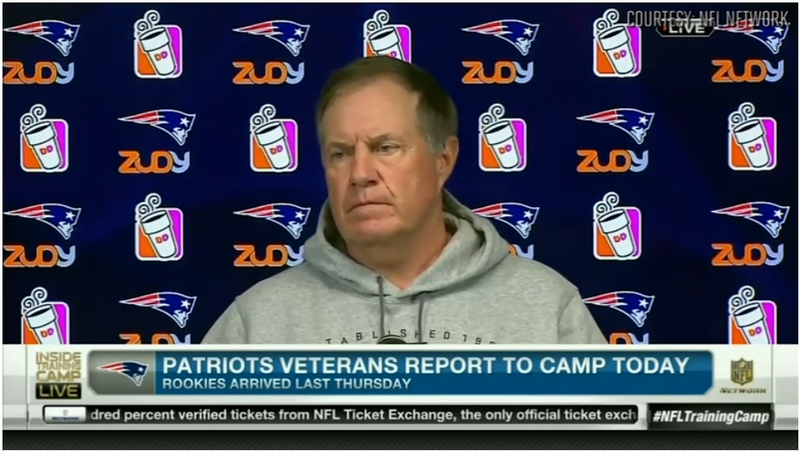 If you haven’t seen the Belichick press conference yet I am sure you can imagine how it went: Belichick, stone-faced, wearing a hoodie, giving reporters nothing by responding with cliche answers. Brady posted a lengthy response on his Facebook page to his suspension being upheld by the league. Brady made many – I am sure carefully-stated and pre-read by his attorney – points in this post. I have pulled a couple of the most important quotes below, but I encourage you to read the entire thing here. Now that all of the most recent facts about Deflategate have been listed, let’s get into the fun stuff. First off, I think everyone is making too much of the destroying of the cell phone. Brady is not only a football player, but also a private citizen who has right to not give up his cell phone in an investigation. Let’s not forget, as Brady said in his post, the NFL was given texts and emails that Wells requested. The following tweets, one from a CBS Sports reporter and the other from a Fox Sports reporter, might put things about the cell phone in context. Enough about the cell phone that has become almost infamous in the past 24 hours. Let’s get into what I think actually happened, and why I think Brady will not miss any games. Take it away Skip Bayless. I don’t always agree with Bayless, but in this Brady stuff I do. I believe Brady had a wink-wink thing going on with the ball boys, meaning Brady himself in 100 percent innocent. I think Brady and his ball boys had an understanding of how Brady likes his footballs. There is not doubt Brady like them under-inflated compared to the league average, but this does not mean he instructed people to under-inflate the footballs below what was allowed by the league. I find it hard to believe every single players knew, prior to Deflategate, the exact PSI range that was allowed by the NFL. The ball boys might have, but I do not think the quarterbacks themselves did. This means Brady may have instructed the ball boys prepare the footballs with less air than usual, but I find it hard to believe Brady would have instructed them to purposely break the rules. If this is what actually happened, I wish Brady just came out and said something like this on Day 1 at his press conference in between the AFC Championship Game and the Super Bowl. It would have meant Brady taking some of the blame, but this all would have gone away by now, and I do not think Brady would have gotten suspended. Without getting into too much detail about the legality of what could happen if Brady takes the NFL to court over his suspension, I think Brady will not miss any games. If this does go to court, the one thing I know for sure is that it will take a lot of time. The case will almost certainly be going on well into the upcoming NFL season and I bet Brady would be allowed to play until the case is settled. I said from Day 1 that Brady would not miss any games, mainly because missing games would mean Brady not playing in the season opener against the Pittsburgh Steelers on that Thursday night in September. It’s bad enough the league’s opening night is going to be surrounded with this Deflategate story. I doubt the league wants Big Ben Roethlisberger going up against anyone other than Tom Brady on that field to kick of the season. Many people have been saying the league does not have any real evidence against Brady if this goes to court. I’ll save that for another article in itself if we get that far. Kraft coming to Brady’s defense earlier today says a lot to me. Kraft has to know this is about to get ugly, so for him to put his reputation on the line and side with Brady says a lot. In an unrelated issue, I want to bring up something the NFL also did yesterday. The league tried to pull a fast one over on everyone by releasing some new information about a reduced suspension at a time when the NFL damn well knew no one was paying attention to anything other than the Brady stuff. I’m going to leave that right there, but I just wanted to make sure everyone was aware that this happened. I’m going to leave you with a couple Bill Simmons tweets that just sum up this entire Brady saga, as well as the NFL, too perfectly. To be fair, Goodell handled Spygate, Bountygate, Rice, concussions and the ref strike so well that he deserves the benefit of the doubt. I’m excited to hear from various ex-players, ex-coaches and ex-GM’s of teams that lost to the 2001-15 Pats weigh in objectively on TV today. This entry was posted in Home, NFL and tagged Bill Belichick, Bill Simmons, cell phone, DeflateGate, National Football League, New England Patriots, NFL, NFL Commissioner Roger Goodell, Robert Kraft, Roger Goodell, Spygate, Ted Wells, Tom Brady. Bookmark the permalink.